More than 350,000 in print! Read a Q & A with Richard Guare, our February Author of the Month! Sign up to receive e-alerts on upcoming titles by Drs. Dawson and Guare (with special discounts)! There's nothing more frustrating than watching your bright, talented son or daughter struggle with everyday tasks like finishing homework, putting away toys, or following instructions at school. 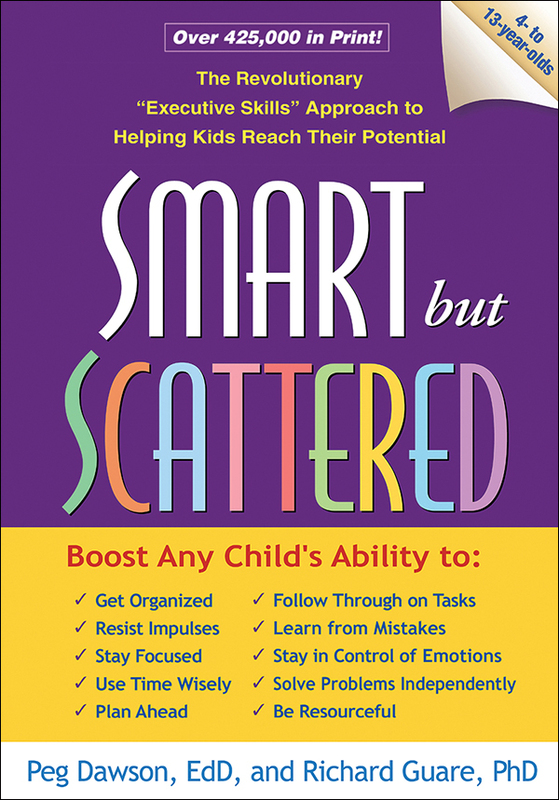 Your "smart but scattered" 4- to 13-year-old might also have trouble coping with disappointment or managing anger. Drs. Peg Dawson and Richard Guare have great news: there's a lot you can do to help. The latest research in child development shows that many kids who have the brain and heart to succeed lack or lag behind in crucial "executive skills"—the fundamental habits of mind required for getting organized, staying focused, and controlling impulses and emotions. Learn easy-to-follow steps to identify your child's strengths and weaknesses, use activities and techniques proven to boost specific skills, and problem-solve daily routines. Helpful worksheets and forms can be downloaded and printed in a convenient 8½" x 11" size. Small changes can add up to big improvements—this empowering book shows how. See also the authors' Smart but Scattered Teens and their self-help guide for adults. Plus, an academic planner for middle and high school students and related titles for professionals.